How does the licensing work for S3 Media Maestro? 2 site license - This will allow you to install S3 Media Maestro on 2 WordPress site. 10 site license - This will allow you to install S3 Media Maestro on 10 WordPress sites. 25 site license - This will allow you to install S3 Media Maestro on 25 WordPress sites. A license must be activated on your website to ensure you receive feature updates, bug fixes, security patches, and product support. If you have overextended your license activation limit, you will not receive updates. 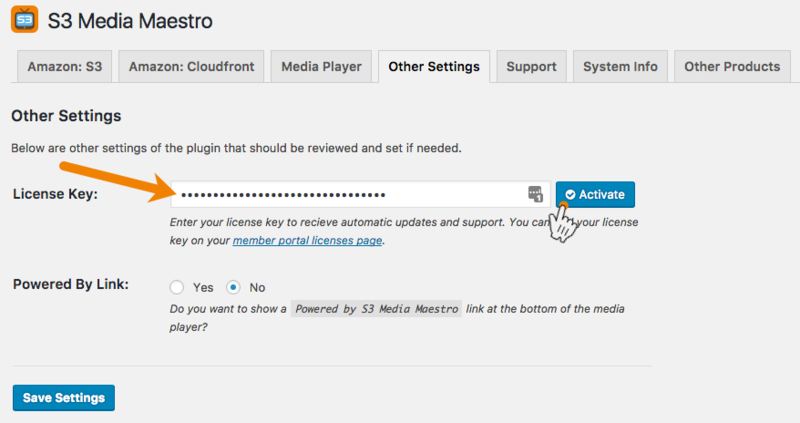 To activate your license click on Settings →S3 Media Maestro, then click on the Other Settings tab. Insert your license key and click Activate. ***NOTE - S3 Media Maestro is not to be commercially resold and cannot be white labeled. Violating these conditions will result in your license being deleted without any recourse with respect to your license purchase.